I start with dimensionalized steel, this is 1084 1/8" thick x 2" deep x 48" long. I order steel as close to the finial dimensions for specific knives as possible. I scribe the template onto the steel using a hardened piece of steel. 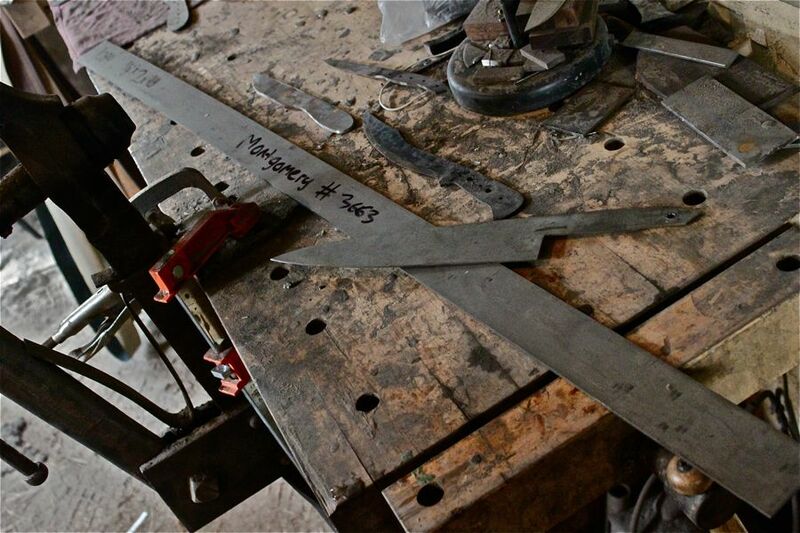 Once I am sure the scribe lines are distinct enough I cut off of the length of steel using my chop saw. 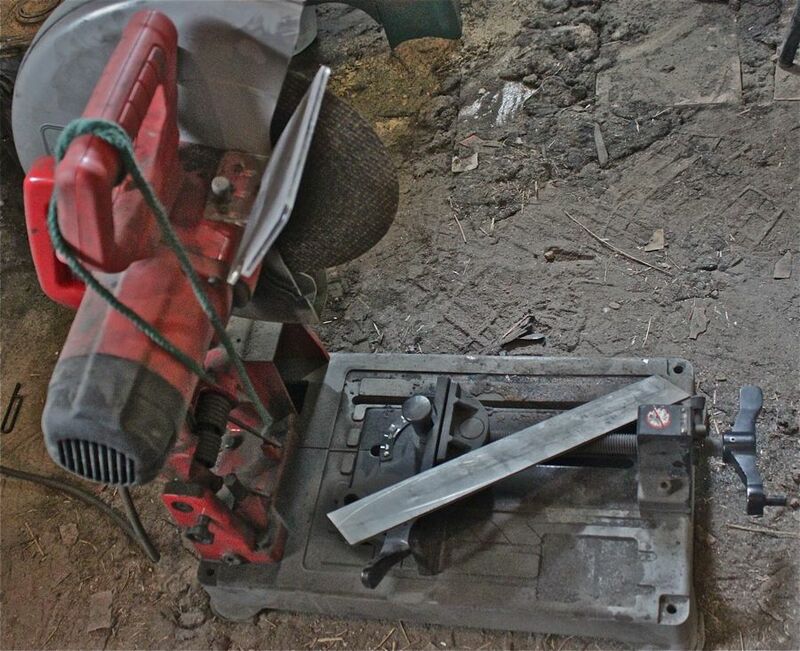 I then will profile the blade shape using my 2"x72" belt grinder. I use a large contact wheel for a bulk of the work, then clean it up with the slack belt for curves and the flat platten for straights. I use a center punch to mark where I want holes to be and drill them with a drill press. The holes should be .002" or so bigger than your pin stock. a 1/4" pin will not fit into a 1/4" hole. This knife will use 3 1/4" pins, the other holes I have drilled are bridge holes. Epoxy will flow into these creating a better bond through the tang. I then flatten the tang on a circular disk grinder, this also takes off any burrs left by the drilling. Now it is time to start grinding Primary grind lines, the bulk of the work here. I use a flat platten for most knives. 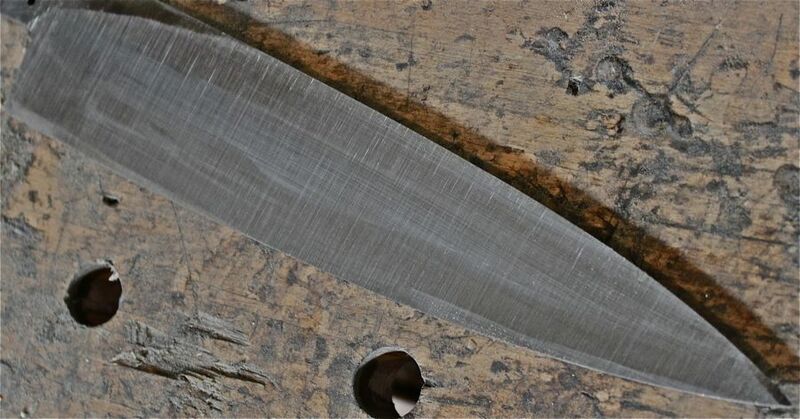 I prefer a flat ground knife to hollow ground ones due to cutting performance. 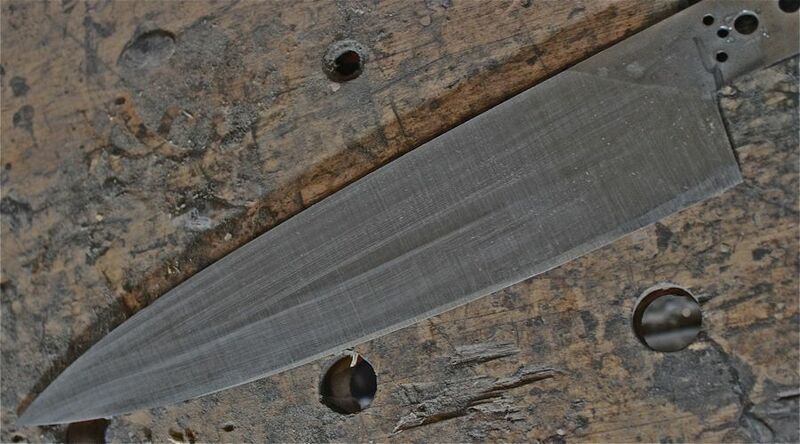 Get both sides looking the same, with the thickness of what will become the cutting edge down to 1/16" or a hair under, depending on the steel, the edge needs to be centered to the spine. The blade should feel evenly tapered spine to edge and you should be not be able to feel any stray grind marks. I use 60 grit belts for this stage of grinding. After some metallurgy, equalizing and annealing, this is reducing the grain size of carbides and leads a stronger less brittle knife steel. 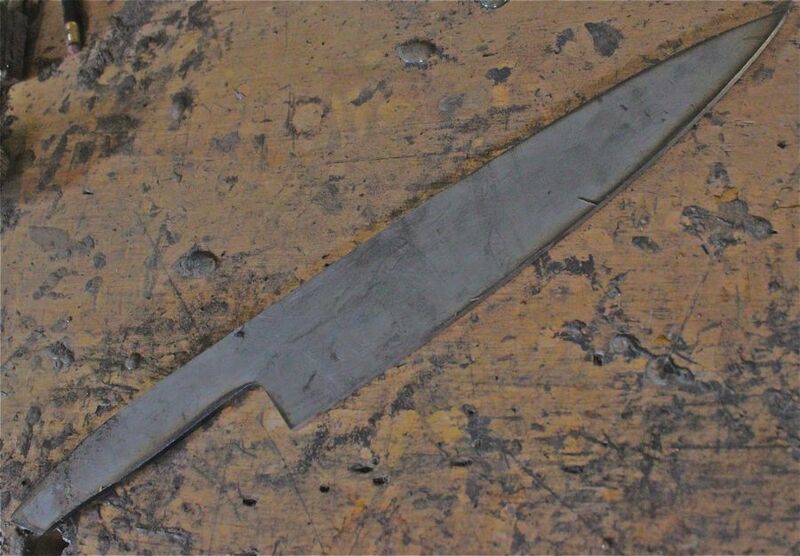 It is now time to stamp the blade and do the heat treating process. Heat treating is the hardening, via quenching, and tempering, softening, of steel. The steel comes out looking pretty rough, this is a very stressful process on steel, so I usually wait to work on it farther. I start grinding on the heat treated blade with 80 grit, go up to 120 grit when I am close to finial shape, with 1/32" or so. I will put a belt edge on it at this point with the 120, and get it down to finial dimension. 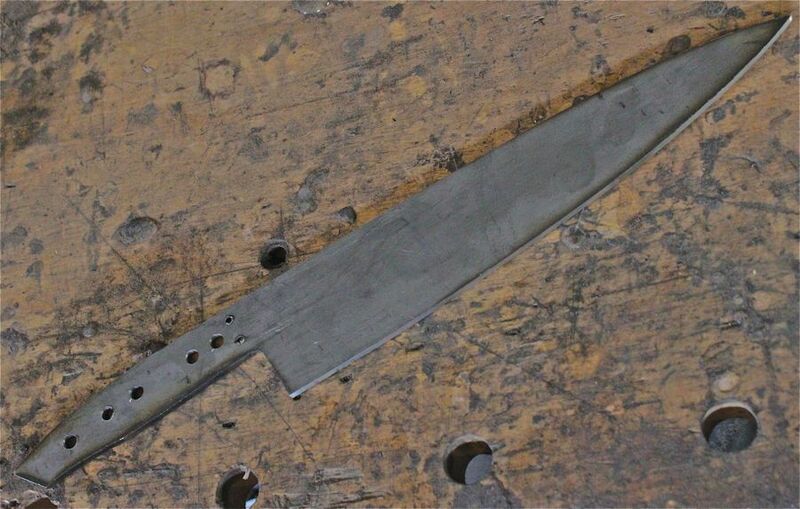 220 and 400 grits come after that refining the edge and polishing the blade. Then to the buffer with no scratch compound. And the blade is done. Now, just don't scratch it! The handle material is prepared, in this case I epoxied water buffalo horn to stabilized black ash burl, onto a piece of white liner material. I cut the handle material close to shape before hand. 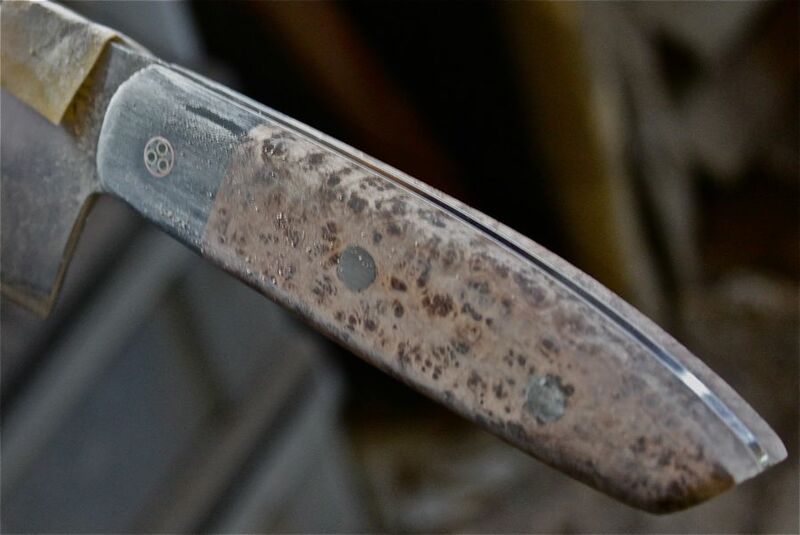 Once the epoxy is cured I drill the holes through the tang into the handles, first the right side, then through the right side into the left, or show side of the knife. 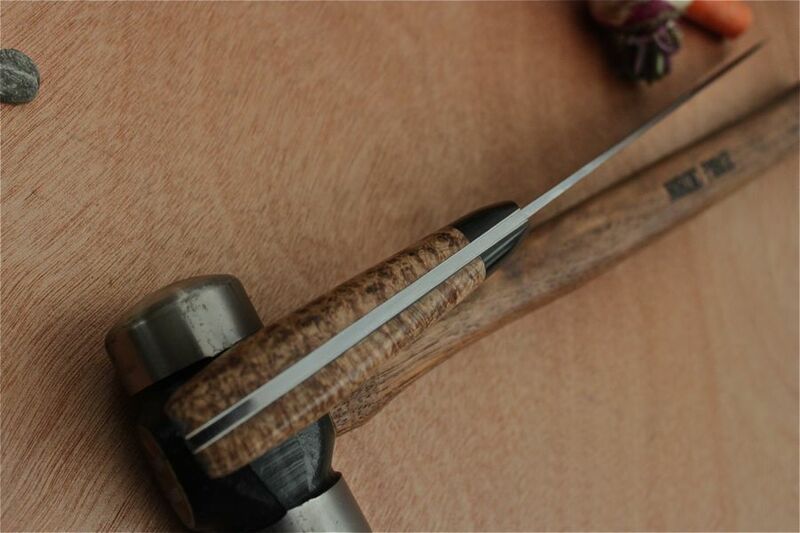 Once you can put pins all the way through, I grind the handle material completely to shape. The closer it is to the tang, the less epoxy you waste, and the lower the chance you grind too much later. Before you epoxy your handle on you MUST finish the front of the handle material completely. Once it is attached to the knife, you will not be able to work it without scratching the blade. I make sure they are perfectly even, at the proper angle and get them to 400 grit and buff. Any contouring to this area should also be done now. Now for epoxy. Make sure you have acetone and a cloth ready at this point. Apply epoxy to both insides of the handle material. Feed the pins through one side and place the tang onto the pins. Make sure the is enough epoxy to fill the bridge holes, and place the other half of the handle on. At this point I add one spring clamp to the bottom, this will squeeze out most of the extra epoxy, and I will turn the mosaic pin to the desired orientation. Then add two more spring clamps and in the case of handles with this type of bolster, a kant twist clamp to the front, gently. 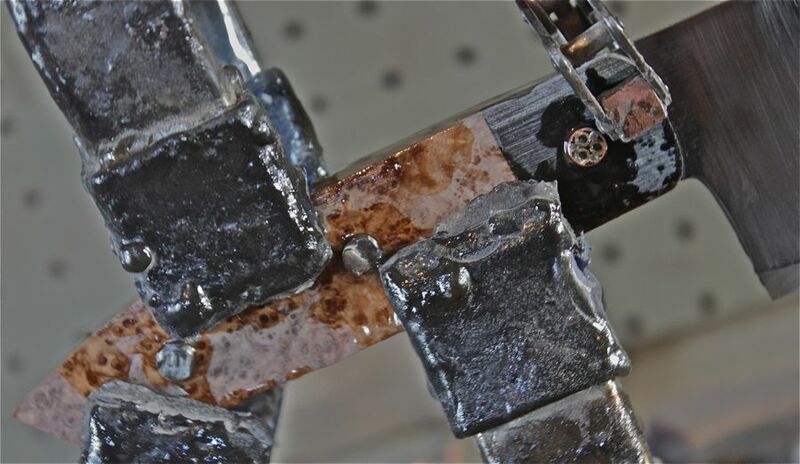 You do not want to squeeze out all of the epoxy, just the extra. Once the epoxy is cured, I use my belt grinder to contour the handle. The goal here is no hard edges, nice a smooth transitions and comfortable feel in the hand. I will take it to 400 grit, then the hand sanding starts. Depending on the handle I go to 400 or 2000 before buffing. Also dependent on the type of handle material is whether or not I will use buffing compound, stabilized and really dense materials get compound, others do not. If you buff a wood that has pore space with compound it will look dirty, you have to sand that all out and buff again, without compound. Yes, I learned this the hard way with Olive Wood. 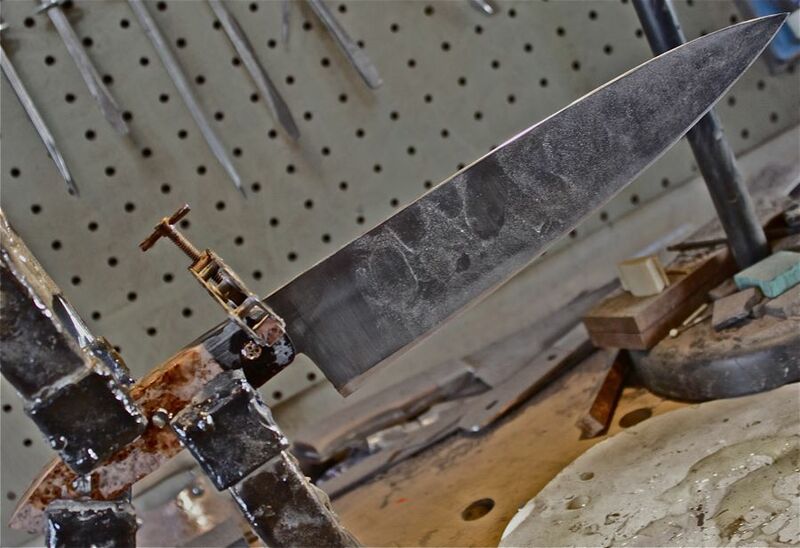 A note on sharpening: I sharpen my blades to a finial scary sharp edge before the hand sanding is done. This ensures that the sharpening process does not leave the handle dirty, this is mainly a concern with lighter colored un-stabilized woods. And time to photograph and prep for shipping.